More than 250 of America's most eminent legal scholars have signed a letter protesting against the treatment in military prison of the alleged WikiLeaks source Bradley Manning, contesting that his "degrading and inhumane conditions" are illegal, unconstitutional and could even amount to torture. The list of signatories includes Laurence Tribe, a Harvard professor who is considered to be America's foremost liberal authority on constitutional law. He taught constitutional law to Barack Obama and was a key backer of his 2008 presidential campaign. Tribe joined the Obama administration last year as a legal adviser in the justice department, a post he held until three months ago. He told the Guardian he signed the letter because Manning appeared to have been treated in a way that "is not only shameful but unconstitutional" as he awaits court martial in Quantico marine base in Virginia. The US soldier has been held in the military brig since last July, charged with multiple counts relating to the leaking of thousands of embassy cables and other secret documents to the WikiLeaks website. Tribe said the treatment was objectionable "in the way it violates his person and his liberty without due process of law and in the way it administers cruel and unusual punishment of a sort that cannot be constitutionally inflicted even upon someone convicted of terrible offences, not to mention someone merely accused of such offences". The harsh restrictions have been denounced by a raft of human rights groups, including Amnesty International, and are being investigated by the United Nations' rapporteur on torture. 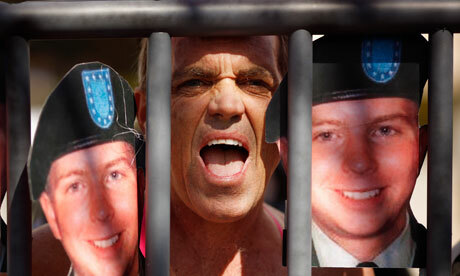 Tribe is the second senior figure with links to the Obama administration to break ranks over Manning. Last month, PJ Crowley resigned as state department spokesman after deriding the Pentagon's handling of Manning as "ridiculous and counterproductive and stupid". The intervention of Tribe and hundreds of other legal scholars is a huge embarrassment to Obama, who was a professor of constitutional law in Chicago. Obama made respect for the rule of law a cornerstone of his administration, promising when he first entered the White House in 2009 to end the excesses of the Bush administration's war on terrorism. As commander in chief, Obama is ultimately responsible for Manning's treatment at the hands of his military jailers. In his only comments on the matter so far, Obama has insisted that the way the soldier was being detained was "appropriate and meets our basic standards". The protest letter, published in the New York Review of Books, was written by two distinguished law professors, Bruce Ackerman of Yale and Yochai Benkler of Harvard. They claim Manning's reported treatment is a violation of the US constitution, specifically the eighth amendment forbidding cruel and unusual punishment and the fifth amendment that prevents punishment without trial. In a stinging rebuke to Obama, they say "he was once a professor of constitutional law, and entered the national stage as an eloquent moral leader. The question now, however, is whether his conduct as commander in chief meets fundamental standards of decency". Benkler told the Guardian: "It is incumbent on us as citizens and professors of law to say that enough is enough. We cannot allow ourselves to behave in this way if we want America to remain a society dedicated to human dignity and process of law." He said Manning's conditions were being used "as a warning to future whistleblowers" and added: "
I find it tragic that it is Obama's administration that is pursuing whistleblowers and imposing this kind of treatment." Ackerman pointed out that under the Pentagon's own rule book, the Uniform Code of Military Justice, Manning's jailers could be liable to prosecution for abusing him. Article 93 of the code says "any person who is guilty of cruelty toward any person subject to his orders shall be punished". The list of professors who have signed the protest letter includes leading figures from all the top US law schools, as well as prominent names from other academic fields. Among them are Bill Clinton's former labour secretary Robert Reich, President Theodore Roosevelt's great-great-grandson Kermit Roosevelt, the former president of the American Civil Liberties Union Norman Dorsen and the writer Kwame Anthony Appiah.